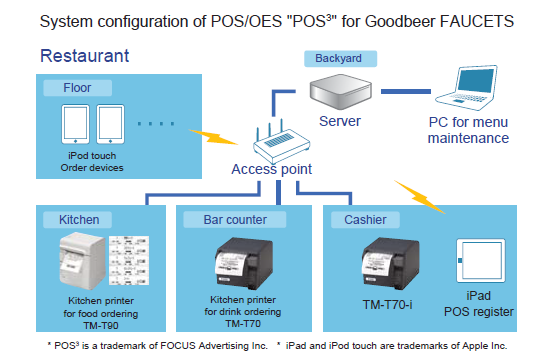 Goodbeer FAUCETS introduced a POS/order entry system (OES) called POS3 (POS cube) provided by FOCUS Advertising Inc. This system features flexible configuration that can be adjusted to suit the scale of business and the customers' needs. Using an iPod touch to take orders and an iPad for the POS terminal, this bar established a smart system fit for its stylish interior. TM-T70-i plays a role not only as a receipt printer, but as a hub which sorts orders into food orders and drink orders, then sends them respectively to TM-T90 and TM-T70 in the kitchen to print them. 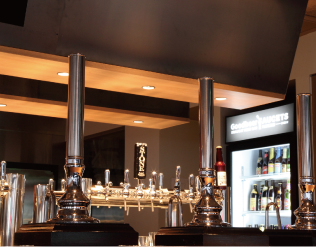 "nide.inc"; the operating company of Goodbeer FAUCETS, is an advertizing and design company, so it wanted to use a system that was stylish and fit for the bar's atmosphere as well as the usability.For its stylishness and easy-to-operate usability, the company highly valued and decided to deploy POS3; which was really different from ordinary traditional POS systems as POS3 maintenance of the master data such as changing menus can be done on the spot using a PC or an iPad, without requesting the manufacturer. It is really helpful for including the new barrels which come in every day onto the menu then and serving them on the same day. TM-T70-i is also highly appreciated for its high print speed, the design and color fit for the shop image and easiness of exchanging paper rolls. The bar manager Mr. Toshihide Morozumi emphasized the visible effect of POS3 implementation. He continued, "Just when taking orders, the customers asked us 'What are you doing with an iPod?' or said 'Wow, you can do that much using an iPod.' Such conversations are very significant for triggering communication. Besides, since our stock of beer changes every day, we have to register items on the menu very often. But now we can do it easily by taking photos and entering text using a computer or iPad. This system will make you feel and expect something extra which you can never get from a traditional POS system using dedicated machines. EPSON printers will take away shop owners' anxiety. "From my experience, I can trust EPSON printers. Compared with any other manufacturer's printers I've seen, EPSON printers print faster and in higher quality. Our shop's logos they print are beautiful, and the text they print is very easy to read. Besides, I was surprised that paper rolls can be exchanged easily from the front. Our owner company is an advertizing and design company, so the design and color of printers were very important to us. I rate EPSON printers we use highly because they are in black, compactly designed and never spoil our bar's atmosphere. The planning director of FOCUS Advertising Inc., Mr. Takeshi Kurita told us in our interview, "POS3 is a next generation stylish POS/OES system using iPod touch and iPad. With such commercially available general purpose devices, this system can reduce the costs and offers good maintainability since the devices can be easily replaced. The novelty, functionality and design of the system were probably the major factors that led Goodbeer FAUCETS to choose our system. TM-T70-i is an optimal printer for POS3. "The decisive factor in selecting TM-T70-i is its web service print function which can print XML data compliant with OFSC*1 device connection standards*2. For the system configured using general purpose devices such as iPad, printers which can directly print without a dependency on OS have a high compatibility. Besides, compliance to the OFSC device connection standards provide assurance for further interaction with external devices and system expansion in the future. When developing the system, the sample program was really helpful, so it took practically a month to commercialize it. I would like EPSON to lead restaurant business further through the activities like OFSC.